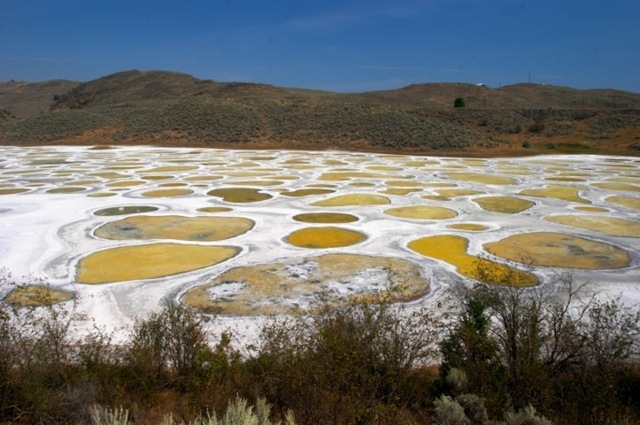 Spotted Lake is a saline endorheic alkali lake located northwest of Osoyoos in British Columbia. 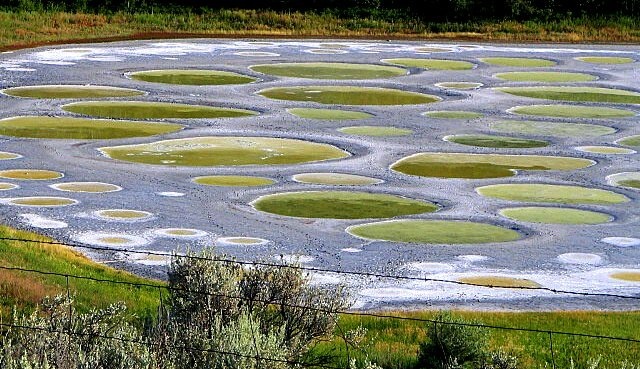 Spotted Lake is very highly concentrated with numerous different minerals. 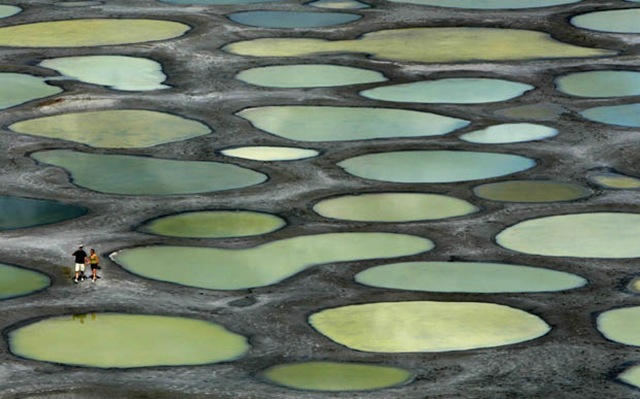 It contains some of the highest quantities (in the world) of magnesium sulfate, calcium and sodium sulphates. It also contains extremely high concentrations of 8 other minerals as well as some small doses of four others such as silver and titanium. 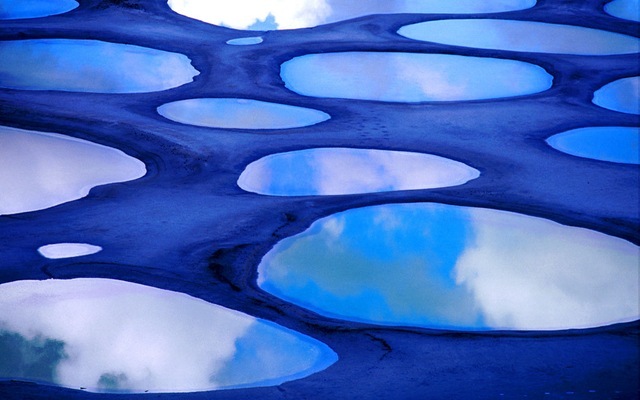 Most of the water in the lake evaporates over the summer, leaving behind all the minerals. 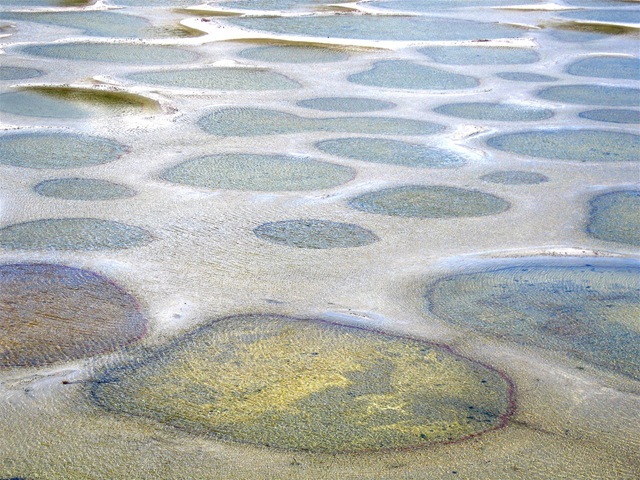 Large “spots” on the lake appear and depending on the mineral composition at the time, the spots will be different colors. 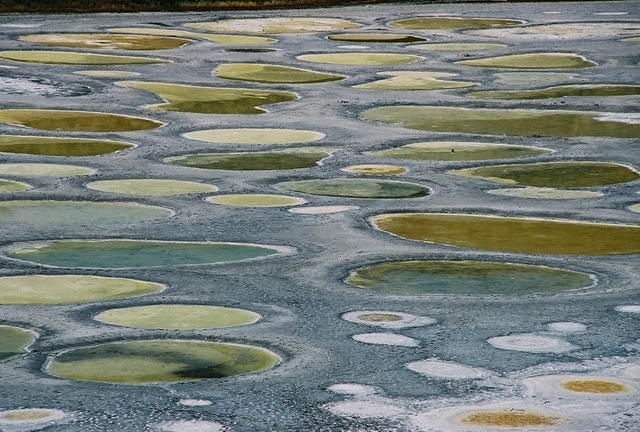 The spots are made mainly of magnesium sulfate, which crystallizes in the summer. 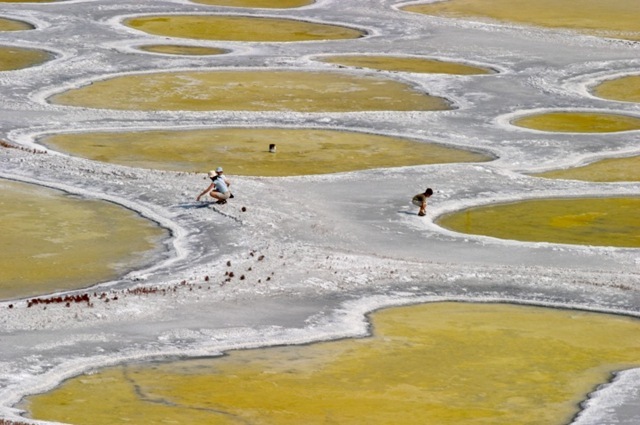 In the summer only the minerals in the lake remain, and they harden to form natural “walkways” around and between the spots. 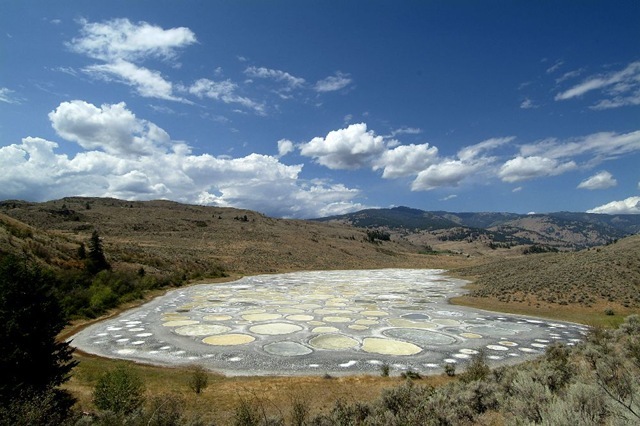 Originally known to the First Nations of the Okanagan Valley as Khiluk, they considered it a sacred site, primarily as they regarded the lake’s waters as possessing therapeutic value. 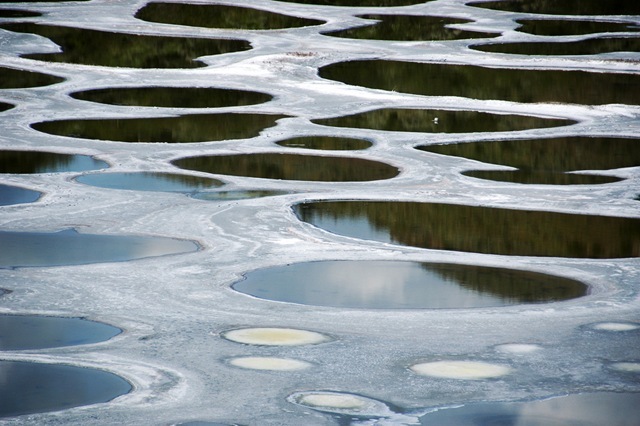 The lake’s minerals were also put to use in the manufacture of ammunition for World War I. The lake and its surrounding land were not actually owned by the first Nations; it was owned by the Ernest Smith Family for about 40 years. Despite this, the First Nations were very protective of the lake; so protective that when, in 1979, Smith attempted to have a spa at the lake, they attempted to buy the lake so they could keep it as a sacred site. After over 20 years of trying but failing to convince Smith to sell the land, they finally did make a deal in late October 2001, when they bought 22 hectares of land for a total of $720,000. The First Nations paid $150,000 while the Indian Affairs Department paid the remainder. To this day, a fence keeps people from reaching the lake’s shore by walking down there from the highway. One can easily see the lake while driving by at high speeds in their car. A lot of people stop on the side of the road for a longer look. At a gate of a driveway that leads to a house near the lake, there is a small sign telling visitors about the lake’s healing powers. 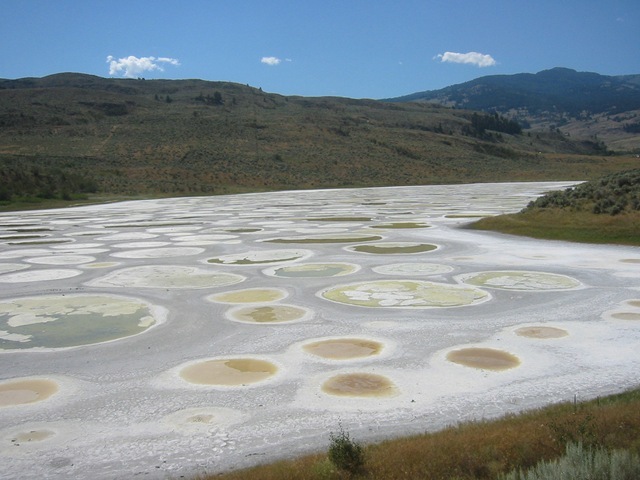 Location: It is located near the city of Osoyoos, beside Highway 3, Northwest of Osoyoos, British Columbia, Canada.